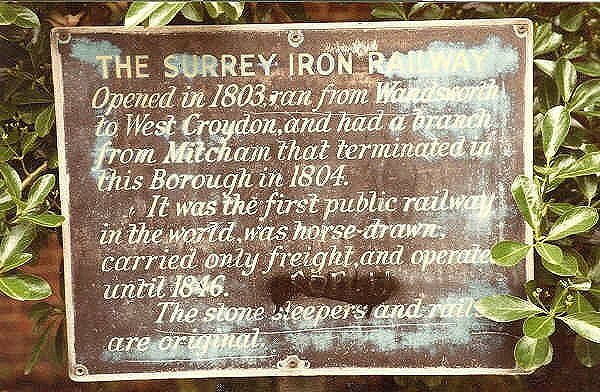 The Surrey Iron Railway is famous for being the first company in the world to include the word "railway" in it's title. Despite this it was not what we today would recognise as a railway. It was actually a plateway, where vehicles with plain wheels ran along flanged rails. In 1799 two proposals were put forward for linking Croydon to the River Thames. One was built as the Croydon Canal, with 28 locks in 9 miles, but was later converted to a railway. The other was a canal along the Wandle valley, to serve the many industries along the route. At its north end was to be a basin at Wandsworth, and it was to use the existing canal basin at Croydon (now filled in and the site of West Croydon railway station). William Jessop was asked on 9th December 1799 to comment on canal proposal. He thought this impractical and instead suggested an iron railway. Plaque beside an example piece of rail. Wallington library 1984. A committee of subscribers under the chairmanship of John Hilbert met in the Wheatsheaf pub in Tooting on 12th December 1799 to receive the report suggesting the line would cost £24,000, . Committee members met William Jessop in Nottingham in July 1800 and spent a week looking at examples of such lines, including those at Beggarlee Colliery near Langley Bridge on the Cromford Canal, then Crich and finally the Peak Forest line. The decision was taken to adopt the name The Surrey Iron Railway Company. The committee was formed of eight gentlemen. William Jessop was engineer and John Foakes and George Wildgoose as land surveyors. A branch to Hackbridge near Carshalton was proposed, bringing the total to 9.25 miles at £33,000. A petition for the construction of the line was put to parliament February 1801. The only modification made by parliament to the proposal was that the rail flange should not exceed 1" in height where the line crossed roads. With this change it was passed as Act 41 Geo III, cap.33, receiving royal assent 21st May 1801 as "An Act for making and maintaining a Railway from the Town of Wandsworth to the Town of Croydon, with a Collateral Branch into the Parish of Carshalton, and a Navigable Communication between the River Thames and the Railway at Wandsworth, all in the County of Surrey". Further acts relevant to the railway were passed in 1805 and 1806. 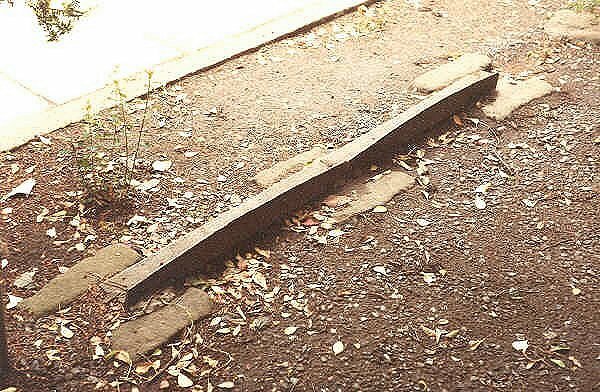 The rails were laid on stone block sleepers which varied in size, but were roughly 14" square by 9" thick. In Wandsworth the line crossed the River Wandle on two wooden bridges. The average construction cost per mile was £2,950. On 26th July 1803 line opened to public. The 1.25 mile Carshalton Branch opened 1st June 1804. The engineer for the line was William Jessop. The total cost of the line was £60,000, which was significantly more than any of the known predictions. Two example plates supported by stone blocks. Wallington library 1984. The company finally ceased to trade in 1846 and the line was abandoned. Part of the route was re-opened in 1855 as a conventional railway running between what are now Mitcham Junction and West Croydon stations (this was the Wimbledon & Croydon Railway). More recently this section of route has become part of the Croydon tramway system. "Improved communication between the Metropolis and various naval bases, particularly Portsmouth, was one of the strong points of the scheme of the Surrey Iron Railway promoters, when in the closing years of the eighteenth century, they projected a railway from the Thames to Portsmouth, with a branch to Chatham. At a meeting held at Wandsworth on June 3, 1802, it was stated that such a railway would enable stores to be carried in any season of the year from the Thames to Portsmouth in twenty-four hours, or, 'upon an emergency of Government, in half the time'. Actually only comparatively short sections of the scheme were translated into working horse-operated railways at that periods, namely, those from Wandsworth to Croydon (opened in 1803) and from Croydon to Merstham (opened in 1805), and it was mainly because of the success of Nelson at Trafalgar the Great Britain ceased to have that keen fear of invasion which had provided the driving force behind the original promotion." From its opening in 1803 traders paid tolls to take their horse drawn wagons along the Surrey Iron Railway, making it an iron equivalent of the then common turnpike roads. The use of stone blocks to support the rails ensured that the horses had a clear walkway between the rails (wooden sleepers were only feasible on steam worked lines). In 1804 W B Luttly, Clerk to the Company wrote that the committee "HEREBY, GIVE NOTICE, That the BASON at Wandsworth, and the Railway therefrom up to Croydon and Carfhalton, is now open for the Ufe of the Public .."
(note the letter "f" substituting for "s" in this early printed document). A painting of the Wandsworth Basin. 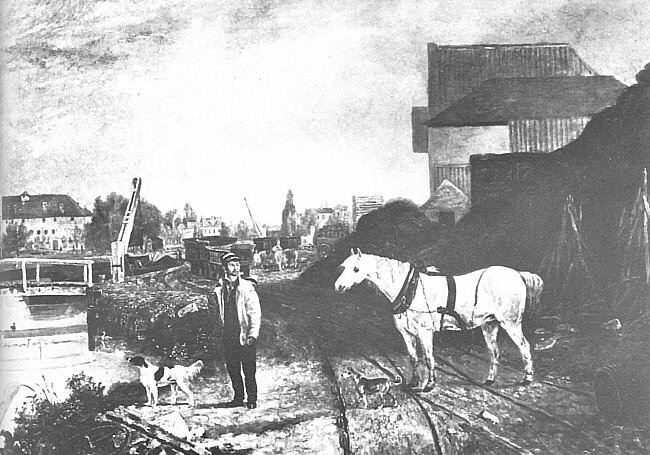 The tracks of the Surrey Iron Railway are visible in the foreground and a string of wagons is visible behind the man. Two dockside cranes are visible in the background. According to the 1804 document the toll for carrying each ton of dung was 1d per mile. Most minerals were 2d per ton per mile, and other goods were charged at 3d per ton mile. Coal was charged at 3d per chaldron per mile. The SIR was a double track line with a gradient of less than 1 in 120 (28.33 minutes of angle). Initially the rails used were 4 in wide on the flat, 1 in thick. The flange was 3 in high and 0.5 in thick. 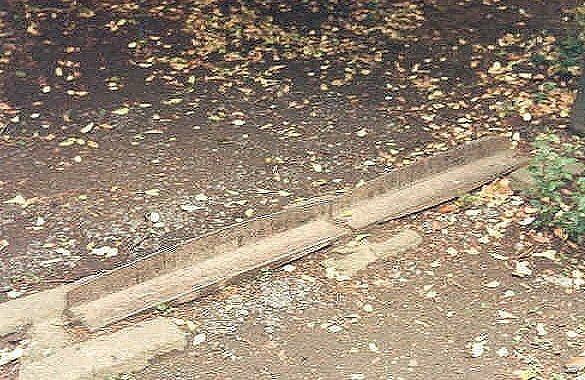 These early rails suffered much damage. Later rails had a strengthening rib underneath. Wagons weighed about 1 ton and were typically 8 ft long and 2 ft deep with a capacity of 80 cu ft. The usual load was about 60 cwt. The wagons had cast iron wheels 32 in diameter and 1.5 in wide. The wagon axles were conical in shape with a diameter sloping from 2.375 in to 1.5 in. The 1804 document mentions that apart from the tolls for the transport of goods, there were also tolls on goods entering or leaving the basin area at Wandsworth. Chaldron wagons of coal were charged at 3d each and other goods were charged at 3d per ton. Soon after the opening of the Surrey Iron Railway a significant extension to the line was built. This was the Croydon, Merstham & Godstone Railway.